As a member of the Healthy Aperture Blogger Network, I was asked to participate in the #PastaFits campaign. I was compensated for my time. Thanks for supporting Hummusapien! Autumn is like one big excuse to face-plant into comfort food. Let’s ignore the fact that it’s about 92 degrees right now in the lovely city of Columbus. Let’s pretend there’s a crisp chill in the air. Let’s imagine we’re wearing our flannel button downs, pretending to understand the football game, and popping pumpkin bars like they’re candy. Ahhhhhh Fall. Gotta love her. In honor of the impending season of all things comfy, let’s chat about pasta. If you know me at all, you know I’m in a Facebook-official relationship with carbohydrates. Pasta holds a special place in my heart because it’s so darn delish, quick, easy, and cheap. My go-to is 100% whole wheat pasta, which is loaded with filling fiber and plant-powered protein to keep me energized through all the crazies. Complex carbohydrates fuel your muscles and brain and digest more slowly, which provides a slower release of energy to power you through your day. Wait. Why have we not created a breakfast pasta?! The wheels are turning. With roughly seven grams of plant-powered protein and less than 200 calories per serving, pasta provides the perfect foundation for a nutrient-dense meal. Pasta also has a low glycemic index, meaning it doesn’t cause as quick of a spike in your blood sugar. Did you know a one-cup portion of whole-grain pasta provides 25% of the daily value of fiber? Load it up with more veggies and you’ve nearly hit your quota for the day! 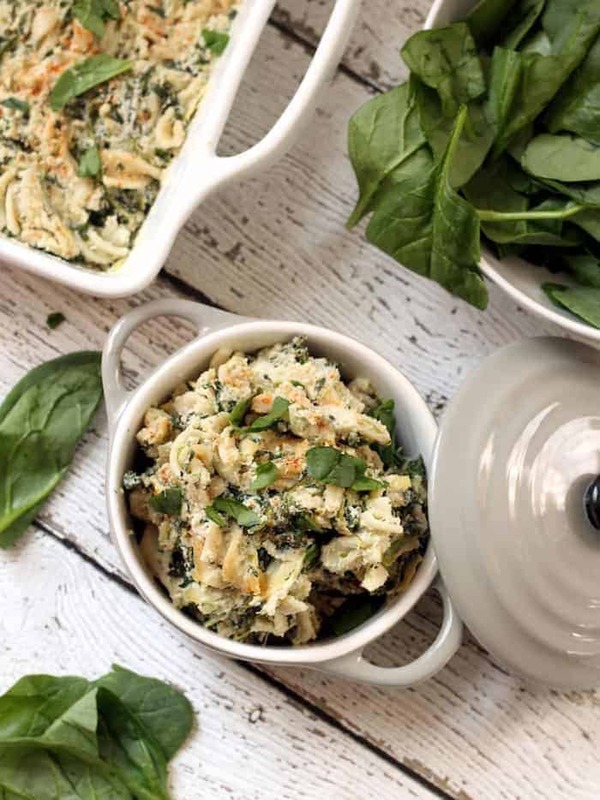 For all those times when you’re craving spinach and artichoke dip but you don’t want to break the calorie bank, this recipe is for you. It has all the creaminess and dreaminess of the classic version but is completely free of mayo and cheese. Shocking, I know. So let’s give a warm welcome to the plant powerhouses that made this epic pasta creation possible….cauliflower and cashews! Whenever I want to make a sauce just a tad creamier, cashews never disappoint. The cauliflower adds body and moisture plus a hefty dose of fiber, vitamins, and minerals. I added an entire bag of spinach to up the veggie count for this dish, but feel free to reduce it a bit if you’re cooking for kiddos. HellooOoooOooOOoo Autumn, we’re ready for you! 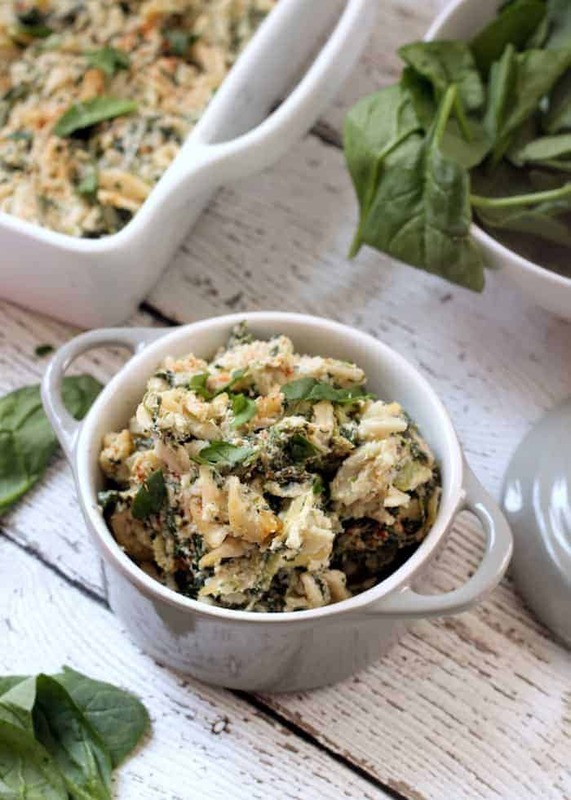 A deliciously creamy and decadent pasta bake that tastes just like spinach and artichoke dip without all the guilt! This vegan and kid-friendly recipe will have the whole family asking for seconds. Meanwhile, cook frozen spinach and cauliflower according to package directions. Drain spinach and set aside. 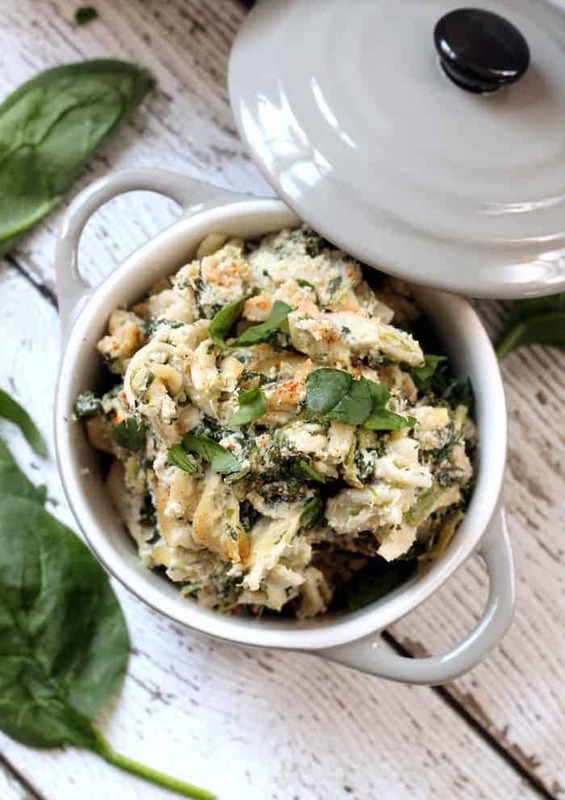 Place cooked cauliflower, drained cashews, one cup of the artichoke hearts, 1/2 cup of the artichoke liquid, lemon juice, nutritional yeast, garlic, dijon, salt and pepper in the bowl of a large food processor. Process for a few minutes, or until nice and creamy. Chop the remaining artichoke hearts. Place in a large mixing bowl along with the sauce, cooked pasta and drained spinach. Sprinkle with smoked paprika (for color, optional) and serve as is OR dump pasta into an 8x8in baking dish and Heat at 350F for about 15 minutes, or until hot. I love this dish drizzled with Frank’s hot sauce! This sounds SO good! And I’m with you on the carb/pasta loving. Now can we get fall to hurry up and come here? SO ready to plant my face in all the carbs! 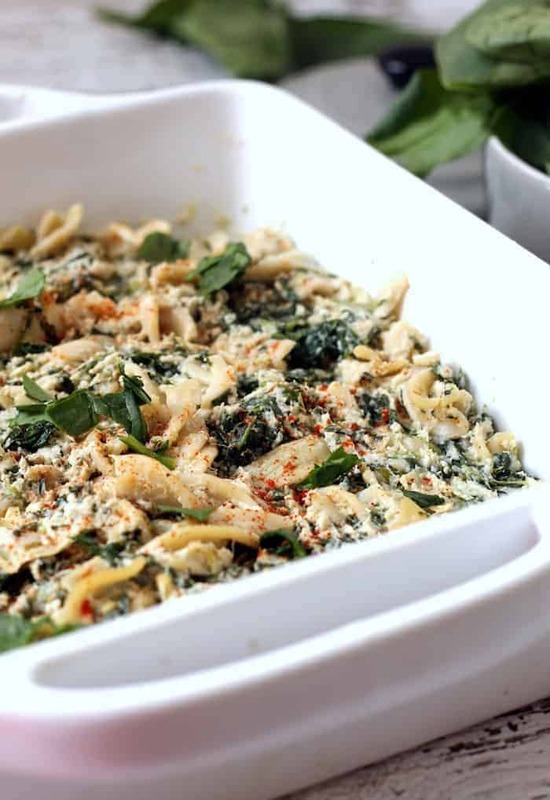 This pasta looks amazing in its spinach and artichoke vegan creaminess. SO healthy, so filling, so fall in my face! Please make a breakfast pasta! Why is that not a thing yet?! This looks wonderful! I am thankful for bulk bins- I can get the right amount of cashews and not spend a fortune. Hi Kate, would love to take a look at your Friday Night Nacho recipe, but the page doesn’t open. Can you send me the link? Your face NEEDS this pasta. I promise. I was wondering if these would work with tofu or shiritaki noodles? I don’t have frozen cauliflower either, should I freeze my fresh one? I’ve tried it with black bean noodles and it works fine. You can use protein powder if you don’t have frozen cauli! I can’t wait for comfy clothes and comfort food. Give me all the comfyness!! This pasta looks delish. Could I use fresh veggies in this instead of frozen? Would one fresh head of cauliflower work, do you think? Thanks in advance! Can I skip the cashews in this recipe?? Will it alter the taste much? My son is allergic to tree nuts. Hi there! Yes, unfortunately it will definitely effect the taste because that’s what gives it that creamy texture. I’m sorry! You could always try using some real cream or maybe pureed cauliflower? I used almondsand it was delicious! I want to serve this to my book club, but I’m wondering if I make it the day before if it will reheat nicely the day of. Hmmmm I’m not sure about this one. It doesn’t really taste like cauliflower, if that helps! Potato or cooked radishes are all I could think of to sub for cauliflower. Parsnips are too sweet…same with squash. By the way, this recipe is great for nightshade allergies and legume allergies! I am allergic to every kind of bean, some seeds and potato, tomato, peppers and a host of other things. Nuts (drupes) are fine. Made this a few nights ago and it was really bad. I am not a picky eater at all but we threw this out. Having been raised by depression era parents that takes a lot for me. It pained me to see the good, healthy ingredients go to waste. Maybe it was the nutritional yeast but it had a really odd flavor. Really wanted to like it but just didn’t. Tasted nothing like spinach artichoke dip at all. Hi, Trh, I am so so sorry to hear that this recipe didn’t work out for you! This was so, so good!!! I’ve missed spinach artichoke dip since becoming vegan (except for fish!) and this was delicious! And I don’t even like cauliflower! Thanks Alexis! Amazing! So happy to hear you love it. This looks amazing! If I wanted to use this with fresh spinach and cauliflower, what would you recommend doing to prep the veggies? Can you use fresh spinach and cauliflower instead of frozen? Is it the same amount? I’m wondering if the yeast completely necessary?